... it's gonna be a good day when you turn on the TV first thing in the morning and see Uncle Rico! 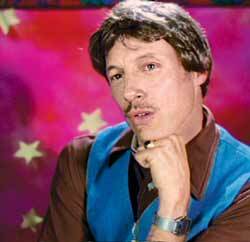 I prefer it when Uncle Rico is the last thing I see before I go to sleep at night....er...gross... nevermind. You both need major help. Uncle Rico is cool, but Kip is waaaaaaaaay cooler. I mean c'mon. The man gets dates off the internet. Only the coolest of the cool guys do that! Seriously...Kip is a pimp! Holla!